Throughout the Pleistocene ice ages, large areas of the earth were covered by vast ice sheets. Global sea levels dropped up to 120 metres below present-day coastlines, exposing large areas of land that were once flooded by shallow seas. These lands became colonised by vegetation, animals, birds and insects over time. During the Ice Age, the island continent to the south-east of Asia comprised New Guinea, Australia and Tasmania as a single land mass. Separating this continent from Asia was a narrow sea about one hundred kilometres wide, over which the first ocean crossings were made sometime before 60,000 years ago. These ancient mariners became the founding peoples of Australia. They were faced with a strange land that was vastly different from the tropical jungles and creatures of equatorial Asia. It is not known how many crossings of the Bassian Plain or Bass Strait were made by humans, but there may have been many over the next tens of thousands of years. The people may have walked over the great plain into the icy hinterlands to the south during the summer months and returned north for the winter. As the Aboriginal people moved across the vast landscapes of Australia they were confronted with new fauna and flora, new food resources and materials, which changed with the latitudes and seasons. Over the next 30,000 years Aborigines occupied a wide range of echo-niches and environments from the northern tropics, across the centre from the east to west coasts, forming unique cultural and linguistically diverse nations of peoples. They adapted quickly in response to climatic and environmental changes, and modified the landscape using fire when necessary, and they lived in harmony and balance with seasonal changes and the environment. The people were fishers, hunters and gatherers who, because they only harvested for subsistence, ensured that economic resources were maintained, and not depleted before moving with the next season to another location. This seasonal movement eventually led the people into the grassy plains of the southernmost peninsula of the continent. Some time before 35,500 years ago, guided by the Milky Way and star systems, several families walked over the flat Bassian Plain and rich hunting grounds of the southern region of this new land. It was in the icy grip of an ice age whose climate was dry and freezing cold. Towards the coast, the Bassian Plain was flat and thinly vegetated with low heathy scrub and native grasses. Towards the south a central range of exposed granite tors rose from the coast below, separating the east and west Bassian Plain. 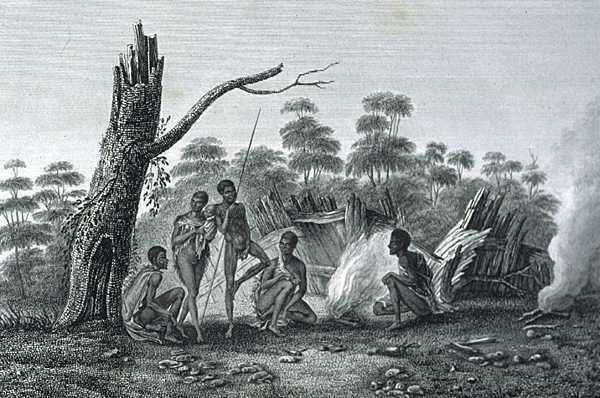 As twilight approached the people would camp along the coastline, constructing windbreaks of scrub, and as they settled in to rest, they would listen to the older members of the group tell stories about the night sky and the Ancestral Beings that created all things, while they warmed by fires eating emu eggs, wallabies and sea birds. By day they moved southward hunting wallabies, wombat and tracking emu to locate the nests for eggs, using the mountains to the south as sentinels to show the way. The people brought with them laws, ceremonial traditions, languages, knowledge and customs of survival and social rules and kinship obligations. Their stone tools comprised large scrapers and hand axes, they used ochre for dress, ceremony and ritual and they buried or cremated their dead. They carried in their veins the blood of their ancestors, who had also travelled great distances into an unknown continent many thousands of years earlier. The stories they told were ancient as they connected them to their ancestors and the lands that they left far to the north. The first Tasmanians used large sandstone overhangs and limestone cave systems as permanent shelters from the cold winds that cut across a frozen landscape. Throughout the Pleistocene a thick icesheet covered the highland plateaus, and glaciers flowed down the mountain valleys within a few kilometres of where the people had made their homes. They lived in caves in the south-west hinterland as well as sandstone rock shelters in close proximity to the ancient coastline. In the south-west, where the many river valleys were covered with low grassy herb fields, the people became specialised hunters of red-necked wallaby, wombat and platypus. They gathered fruits, roots, berries and eggs, made mantles and foot covers out of the skins of animals, and used fire technology to burn the lands to enhance the growth of new seasonal grasses and herbs for the animals. Tools were made from wood, bone and stone. The leg bones of animals were sharpened into bone points for making holes in skins and sewing together for cloaks and foot covers. Bone points may also have been used as points for hunting. A glassy material, tektite, was collected from the meteor crater site north-east of Macquarie Harbour, and sometimes this favourite material was carried many hundreds of kilometres before being refined into small sharp cutting and scraper tools. Along the coast women harvested the sea for a variety of foods including seals, crayfish, muttonfish, warreners and whelks. They also trapped birds, collected emu, duck, swan, redbill and muttonbird eggs, and hunted for small land animals including possum, porcupine and bandicoot. The people used grease from porcupine, possum, muttonbird, seal and penguin to coat their skin as a waterproof layer and for warmth against the extreme weather conditions. The founding population in this new land became the most southerly living humans in the world during the last Ice Age. They were resourceful and extremely adaptive to be able to live in such an inhospitable and frozen landscape. These Aboriginal people practised not only rich social and economic lifestyles, they also had complex spiritual beliefs and performed ceremonies of song, dance and story. Deep inside the caves tens of thousands of years ago they conducted secret/sacred rituals, leaving their ochred hand stencils and red blazes of warning at the entrances and on the walls. Many caves contain the remains of ancient meals and testify to customs and traditions practised by the people of the Ice Age. Other places and cultural landscapes show traces of the first peoples, although many have been lost under the flooded plain and coastline with the rising seas when the ice age ended. The environment began to change as the climate warmed, and the glaciers and ice sheets retreated and eventually disappeared. After 15,000 years ago the area became wetter, resulting in the expansion of rainforests and sclerophyll forests that covered the entire region of the south-west where once there were vast grassy herb fields. As forests covered the hinterlands, the Aboriginal people moved away from their living and ceremonial caves, towards the coastal margins, and watched the rising sea levels that heralded their isolation from the rest of humanity for the next ten millennia. This was the dawn of a new age that was to bring about social, cultural and spiritual changes to a dynamic people in a dynamic landscape. As the oceans rose, the Bassian Plain disappeared and Bass Strait was formed from about 12,000 years ago. The end of the last Ice Age closed the pathways into the southern-most region of the continent and resulted in the peoples of Trowunna being isolated from the rest of humankind for several thousand generations. Sea levels reached present day high and low watermarks about 8,000 years ago. Consequently, the people told and retold stories of their origins, how they walked from the north across the Milky Way, following the star systems to their Island known as Trowunna. Some stories also told of Ancestral Beings' voyage across the saltwater in canoes from the lands to the north. These spiritual ancestors carved out of the land, the mountains, hills, valleys and rivers, and created the Palawa people, the birds, animals, trees and plants. The people believed in good spirits of the day and bad spirits of the night. Their stories were ancient, their spiritual and cultural life was dynamic and their lands and seas rich with abundant economic resources. Their technology was basic yet adequate to meet their semi-sedentary way of life in a temperate environment. The Palawa people continued a fisher, hunter and gatherer economy exploiting the coastal rocky platforms and ocean depths for shellfish, crayfish, seals and sea birds and eggs. They travelled defined pathways to follow seasonal harvests into the hinterland for swan, duck, emu, kangaroo, wallaby, wombat, possum, platypus and fresh water lobster, and gathered fruits, roots, tubers, berries, healing herbs, plants and fibres. The people of Trowunna were culturally diverse, dynamic and inventive. They constructed watercraft out of rolls of bark and reeds tied together using a network of fibre cord. These vessels allowed them access to off shore islands to harvest seal and muttonbird rookeries. Watercraft were used on voyages across wide rivers and deep channels, and into the open seas where knowledge of flowing currents, tidal movements and weather patterns were essential to the safe passage of the families who made these voyages. In the cold, windy areas the people lived in large domed huts constructed out of boughs and covered with sheets of bark, mud and grasses and lined with bark, skins or feathers. Along warmer coastal regions families lived in arched windbreaks around their camping grounds that were located close to rocky shore platforms and fresh water supplies. They left ceremonial structures around the coastline using stone boulders formed into pits, cairns and pathways. They practised a range of ways of disposing of their dead, with cremations, entombments in the hollows of trees and burial in coastal sand dunes. Sacred ochre pigments of red, yellow and white, and black minerals were crushed and ground and mixed with grease to paint their bodies, to draw symbols inside burial tombs, and on the walls of the huts to protect them from the bad spirits of the night. Trowunna was made up of about nine different language groups with physical boundaries of mountain ranges, wide valleys and winding rivers dividing each group. These language groups were subdivided into several extended families who came together at regular times during certain seasons to perform ceremonies, sing and dance, trade goods and exchange marriage partners. The people lived in harmony with their lands and formed close alliances with their neighbours. They harnessed the technology of fire to manage the land, encourage new growth for the wildlife, keep open pathways that networked the island for ease of seasonal movement, maintaining trade and close alliances. Changing seasons from winter to summer were announced with the arrival of welcome swallows from their northern migration, and the yellow blossoms of wattle and boobialla trees heralded the arrival of the muttonbirds with the coming of the warm months ahead. The people watched overhead as twilight faded to night for celestial signs to gather for ceremonies and rituals. Ceremonies through dance were performed to the beat of skin drums and melodious singing told of the stories from ancient times about their origins and to ensure the continuity of abundant supply of food resources. Favourite dances included emu, seal, kangaroo and hunting, throwing, spearing, swimming and diving games were performed to show courage and strength. The Palawa people of Trowunna collected from rich supplies of roots, fungi, lagoon leeks, yakka bread, seeds, orchid bulbs and plant shoots that were harvested throughout the seasons. Their toolkit comprised stone, bone, wood, fibre, seaweed and shell fashioned into hammers, spears, waddies, spatulas, digging sticks, baskets, water carriers, scraping, grinding, cutting and skinning tools. Red, yellow, white ochres were collected from precious quarries and ground into paints for body ornamentation and rituals. The people scarred their bodies with sharp stones and used charcoal and grease to raise the cuts in cicatrices as part of ritualistic beliefs. Complex groupings of engravings were pecked and abraded on sandstone, laminated siltstone, basalt and granite outcrops. These engravings comprised circles, concentric circles, lines of dots and grids, speckles and lineal features left by the ancestors eons ago. Visitors from lands beyond the oceans sheltered their large sailing ships in the sweeping bays of the south, east and northern coasts: French and British explorers made brief communications with the coastal groups, sometimes violent, but mainly friendly and under the watchful eye of the Trowunna peoples. In 1803 ships arrived in the Derwent River and the sound of cutting and hammering resonated through the river valley. Palawa leaders watched from the high hills and waited for the signs from these strange white spirits to find out if they were ancestors returning from the dead. The invasion of Trowunna had begun! Thousands of years of isolation from the rest of humanity that had created unique cultural and social traditions were to be interrupted and changed from this time onward. Further reading: J Flood, Archaeology of the Dreamtime, Sydney, 1983; and The Riches of Ancient Australia, Brisbane, 1983; H Ling Roth, The Aborigines of Tasmania, Halifax, England, 1890; N Plomley (ed), Weep in Silence, Hobart, 1987; Friendly Mission, Hobart, 1966; and The Baudin Expedition and the Tasmanian Aborigines, 1802, Hobart, 1983.